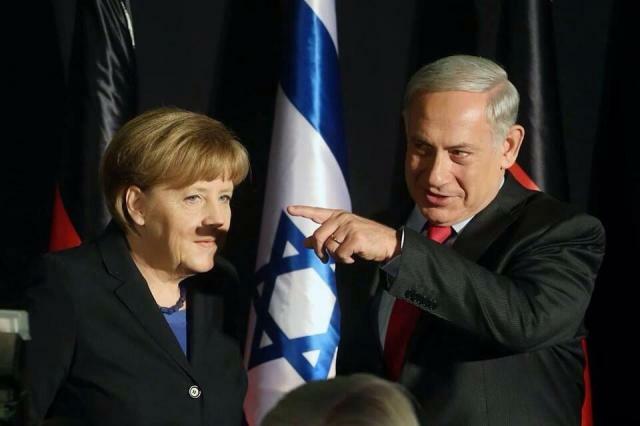 This image went viral today as news outlets carefully tried to caption it. We won’t even try. A picture is worth a thousand words. 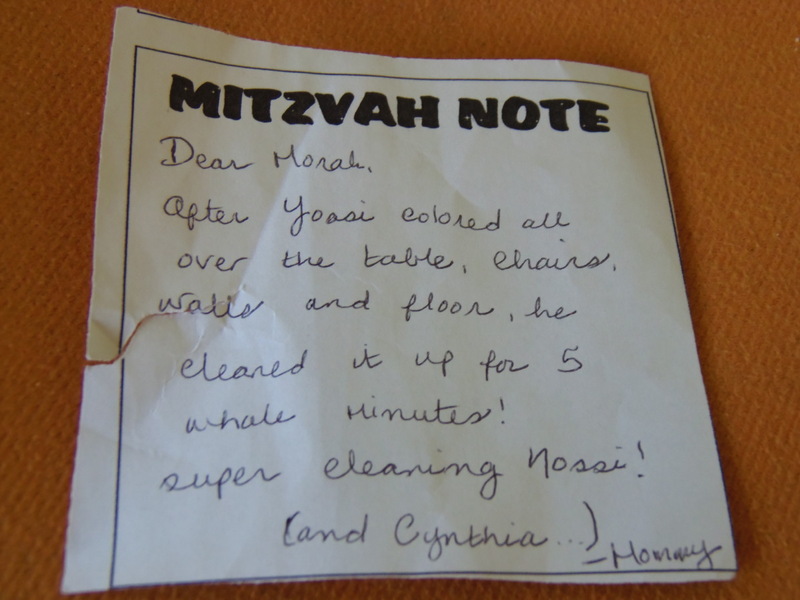 Many preschools around the world encourage children to bring Mitzvah notes to class, detailing good deeds the child has done at home. 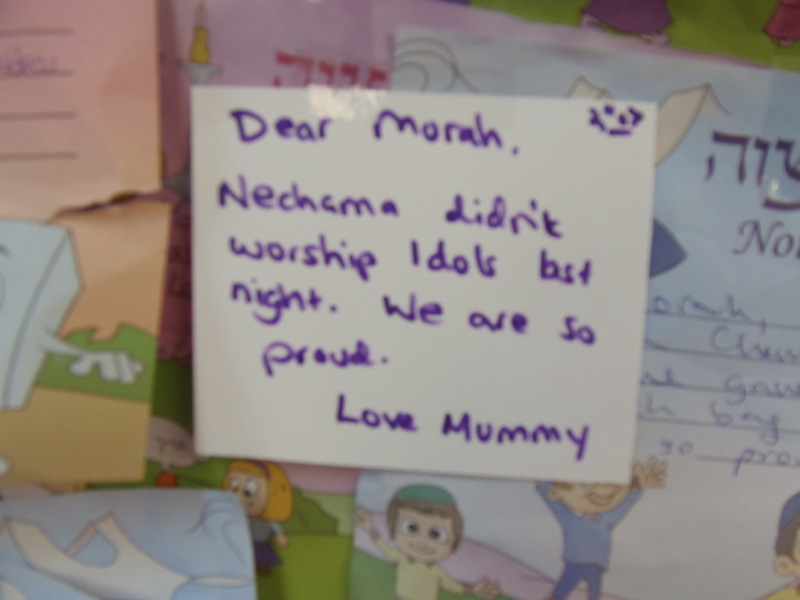 They are read out loud by the teacher (“Morah,” “Giveret,” or “Rabbi”) to much fanfare, giving the child a feeling of pride for doing the good deed, and positively reinforcing the child to continue the good behavior. However, not all parents properly understand the concept. Unfortunately, there are some children who may have a long road ahead of them as they grow out of their preschool years. 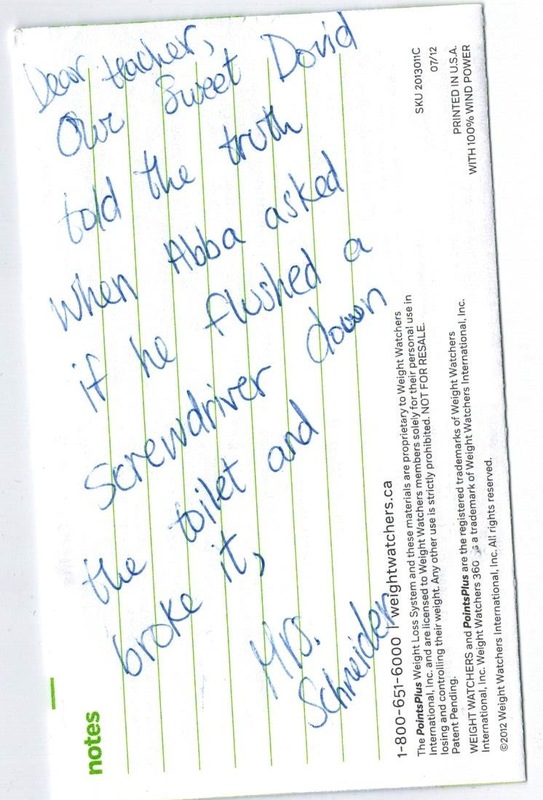 Jewbellish staff Perry Prokopenko, Mendy Pellin, Zvi Hershcovich, and Yaacov Dubrow asked around and pooled our collection of the 7 worst Mitzvah notes in history. 6. Sure you sent your child to the right school? 5. 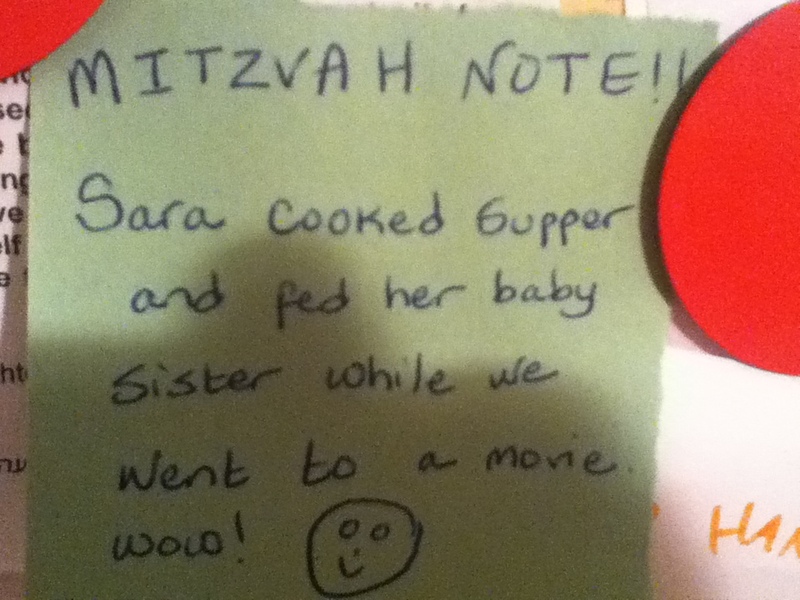 Best part about this Mitzvah note is that it’s written on a WeightWatchers stationary. 3. Apparently this was the only good deed the mother could think of. 1. Parents of the year. 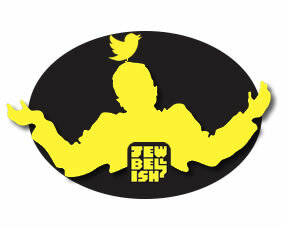 Once again Jewbellish staff are proud to present the funniest Jewish tweets from this past week. 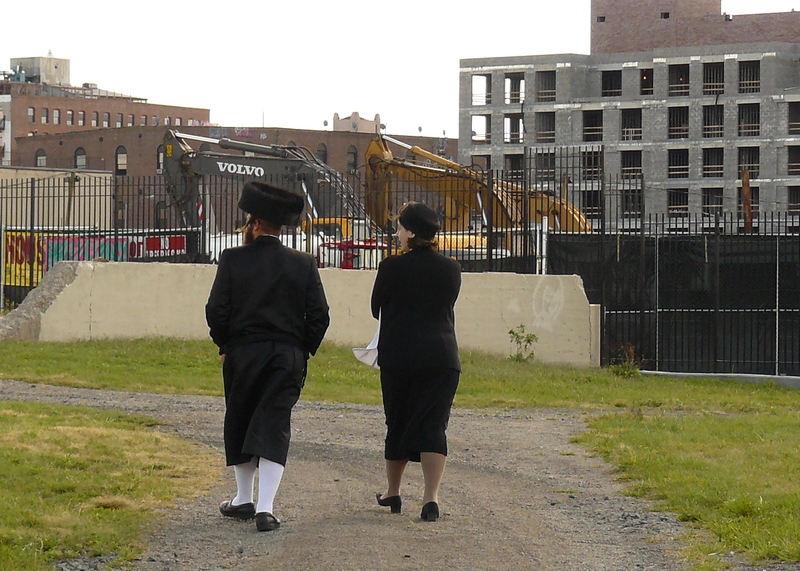 Good thing these guys are all banned from my Synagogue. Sid Caesar is the first Caesar the Jewish people have been sad to see die. We will greatly miss his salad. Don’t smoke the Havdalah candle. When kids were little, wife made matzoh brei, a breakfast dish. They heard it as “monster pie.” It is still monster pie in my house. Recently, lost pages from the “code of Jewish ethics” were unearthed during an archaeological dig at the Vatican. We mistakenly downloaded them illegally off what was supposed to be a torrent of “the ten commandments” and are proud to present them for the very first time to the public. 1. The Midrash relates that four angels were sent to Abraham. The first angel, Gabriel, was broad and muscular. He had been sent to destroy the evil cities of Sodom and Gomorrah. The second angel, Michael, was tall and solemn. He was sent to inform Abraham that he would have a child at the ripe age of 99. The third angel was scrawny and wore glasses. His name was Raphael, and he was there to toss healing potions at Abraham’s nether regions and to care for them until they recovered from the circumcision and were “resown with seedlings.” The fourth angel was a chubby baby named Valentine, sent to reignite the romance between Abraham and his wife, thereby ensuring the future birth of a child. From that day forward, ever since the birth of Isaac, people all over the world have celebrated Valentine’s Day as a day of love, rejoicing, and destroying cities we deem evil, such as Baghdad, Kabul, and Detroit. 2. Valentine’s Day is celebrated with the observance of four traditions. “Mishloach Manot” – the trading of gifts to at least two lovers. “Seudat Valentine’s Day” – the eating of a festive meal, if you know what we mean. “Matanot LaEvyonim” – Handing a gift card to your lover. “Kriyat HaMegillah” – the reading of the Valentine’s Day card, usually accompanied by the throwing of chocolate hearts and rose petals. 3. Being that Valentine’s Day is a joyful holiday, it is considered an auspicious time to fulfil the commandment of being fruitful and multiplying. Therefore, one who is meticulous in observing every law should study accordingly until he knows his wife several times. One should also dress in their very best on Valentine’s Day. Therefore, the Rabbis praise the man who brushes his Streimel, shakes his long cloak, and pulls on his prayer shawl vigorously. 5. If Valentine’s Day falls out on Shabbat, the man and woman light candles together, after which the man must sing a poem composed by himself, Shakespeare, or Bruno Mars, to the tune of Aishet Chayil. The Challah should be in the shape of a heart, and the Shabbat meal should be eaten together with the festive Valentine’s Day meal, and include traditional Valentine’s Day meal foods such as chocolate hearts, strawberries, and edible garments. 6. Valentine’s Day is also known as the Rosh Hashana for matchmakers. Therefore, it is imperative that singles find someone to share a Gefen gluten free chicken noodle soup with. If one has no date for Valentine’s Day, he is permitted to get drunk, provided he does not burn down his ex girlfriend’s house. One may not hide in a tree and ‘pretend’ to be on a Valentine’s Day date with his ex girlfriend. 7. One may not give his lover a pre-written card. Rather, one should be careful to purchase a Valentine’s Day card with a clever limerick or romantic ode inside and enough space for one to add a personal message. 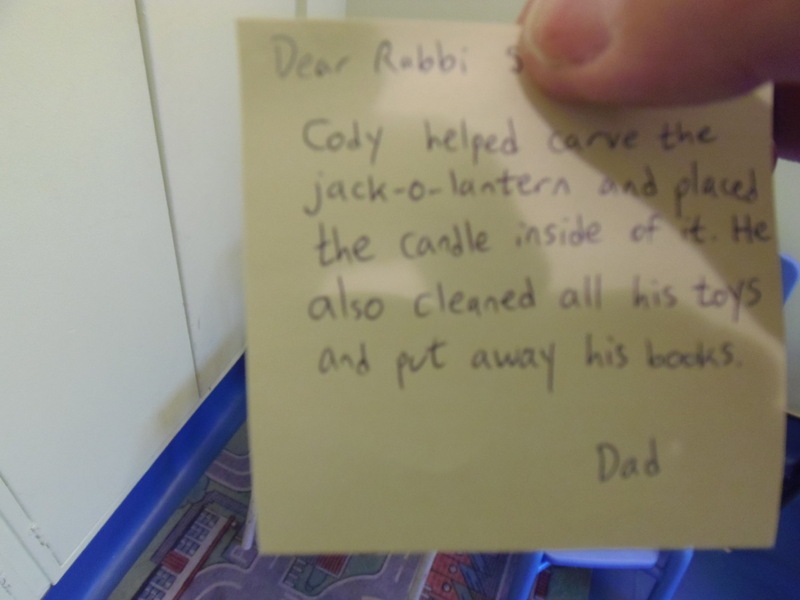 Nonetheless, a righteous man writes the entire card in his own handwriting. Our sages said, he who writes a poem in his own handwriting is guaranteed a portion in the world, to come. 8. The Rabbis recommend a path of rose petals leading from the woman’s place of work all the way through the streets of your town and into a waiting bubble bath. He who cannot afford it is permitted to purchase twelve roses and place them on the pillow of her bed, together with a carefully worded love note. He who can not afford that is encouraged to travel to a graveyard, select the prettiest selection of flowers lying atop a fresh grave, and present it to his loved one. 9. If one forgot to say “I love you” on Valentine’s Day. If he remembered within the period of time that one may say “it’s not me, it’s you,” he may take three steps back, bow once, and then say very quickly, “I love you please don’t dump me on Valentine’s Day.” However, if he remembered too late, he is required to start Valentine’s Day all over from the beginning. 10. One who forgets Valentine’s Day entirely and only remembers on February 14, may rely on the opinion that Valentine’s Day is considered “Avodah Zara” (idolatry). Jewbellish also asked for submissions to our Valentine’s Day laws on twitter, and here’s a small selection of answers. @jewbellish @MendyTV The heart shaped letter you send must be from a reliable source. And the ksav must be legible & written w alot kavanah. Following is a list of Jewish Valentine’s Day traditions around the world. Jews of Yemen like playing pranks on their loved one and send each other Valentine’s Day gifts by drone. The woman of the religious Jewish community of Teaneck, New Jersey have a longstanding tradition to get their wigs done two days before Valentine’s Day. In Israel, men demonstrate their love by swallowing sabras whole, cutting it out of their stomachs with their bayonets, then stitching themselves back up. There is a Jewish tribe in the Amazon forest who are known to dress their babies as angels and have them shoot arrows at each passing airplane. Jews in Florida celebrate a similar holiday to Valentine’s Day called VALIUMtine’s Day, where they complain about their grandkids and take lots of valium. The Jewish community of China celebrates Valentine’s Day by eating the heart of a lamb, goat, chicken, duck, goose, turkey, and cow.